Once again partnering with the Community Health Foundation of Western and Central New York to study issues of regional health, the UB Regional Institute developed a series of four research briefs for a speaker series in the Central New York region. The series, “Speaking of Health in Central New York: Discussions on Topics that Matter,” was designed to foster dialogue among community members and health care leaders on critical health and health care challenges facing the region. Events featured expert presentations and discussions of best practices, as well as research on the state of these challenges in the region. 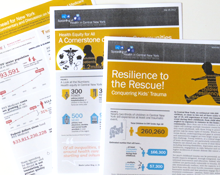 In November 2011, the institute completed an analysis of the scope and impact of adverse experiences on young children in Central New York, from child abuse and neglect to witnessing domestic violence, as well as strategies for building resiliency in children. For the series’ inaugural event in June 2011, the institute explored the issue of building a sustainable health care system for an aging population. The institute will produced research briefs for two additional speaker events to held in 2012. In 2009, the institute concluded a two-year research engagement with the Community Health Foundation for “Reaching for Excellence,” a comprehensive community health planning initiative for Western New York.